Charlie, a member of Middle Park Harriers, was a regular walker with the club in the 1930’s and featured in a number of club wins. Newspaper cuttings of the time show him winning a VAWC 4 mile handicap along Alexandra Avenue in 1938 and winning the 1939 winter season opening race which was a 3 mile handicap in which 32 walkers participated. His career was, like so many others, interrupted by the Second World War, and when the club was reformed, he returned as an official rather than as a walker. A tireless worker for the club, Charlie’s contributions were too many to list. A cabinet maker, he made safety signs for races and was an integral part of the team which built the Alf Robinson Clubrooms at Albert Park in the early sixties. Once the clubrooms were completed in 1963 , he took on the long term role of clubroom maintenance and caretaker (a role he maintained until 1980). During this frantic period of clubroom building, his outstanding contributions to the club were recognised with life membership. He continued enthusiastically for many more years with the club and was in fact Treasurer from 1973 to 1982, helping fill the void left by the untimely departure of both Alf Robinson and Norm Goble. The splendid glass cabinet in the clubroom was made by Charlie and donated to the club. Charlie’s wife Elsie was also made a life member and her great contribution to the club is discussed separately. It is interesting to note that there are 2 husband and wife teams who are life members – the Jacobsons and the Robinsons. 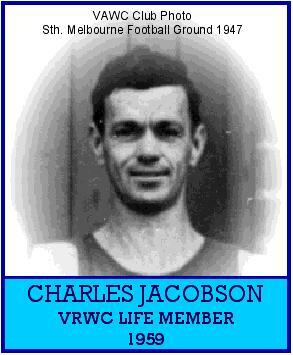 Charlie worked with Alf Robinson for many years in the running of the club and was also involved with Alf in the Australian Federation of Race Walking Clubs. While Alf was President of that organisation, Charlie served alongside him as Vice President. The Jocobson Trophy is awarded annually to the winner of the AFRWC Girls Under 17 5 km championship held in conjunction with the Schedule 1 Carnival.